1. To make the dressing, whisk together the tahini, garlic, yogurt and extra virgin olive oil. 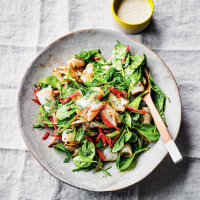 Whisk in the lemon juice until the dressing is smooth - tahini tends to seize when you add anything acidic – then add 3 tablespoons of water and season. The mixture should be slightly thicker than double cream, no thicker, so add more water if you need to. Check the seasoning. Cover and put in the fridge. If you’re making this ahead of time, you need to take it out of the fridge well before you want to serve it, as the cold will make the dressing firm up. 2. Wash the squid, removing any whitish gunge from their insides, and pat dry on kitchen paper (if they’re wet they won’t take on a good colour while they’re cooking). If the squid are small, leave them whole. If they’re larger, cut off the wings and set them aside with the tentacles. Cut the bodies down one side to open them out. Halve lengthways and score the inside of the flesh with a cross-hatch pattern, without cutting all the way through. 3. Put the squid in a bowl with enough regular olive oil to just moisten the pieces. 4. Heat a frying pan until really hot. Season the squid and cook it in batches, pressing down a little on the pieces as they fry. Small squid only need about 30 seconds on each side to become golden and cooked. Season as you go. As each batch is ready, remove it to a warmed plate and squeeze lemon juice over it. Once all the squid is cooked, add a little more oil to the pan and cook the chillies for 20 seconds or so, then toss them into the squid. Add the dill and baby spinach and toss (the leaves will wilt). Put on a big platter, and serve the tahini dressing on the side with lemon wedges.